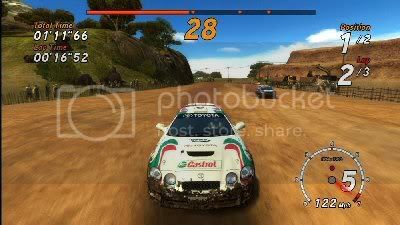 by PaulEMoz in "Sega Rally Online Arcade", "Sega", "Sumo Digital", "XBLA", "XBox 360", "racing"
I love Sega Rally. From the arcade and Saturn versions right up to its rebirth on the 360, it's a great racing game. The original version was most definitely an arcade game... short, sharp bursts of racing on a small number of tracks, with hardly any cars available. It handled like a dream, and constantly kept you coming back for more in the hope of shaving milliseconds from your best times. The current-gen update of Sega Rally (known as Sega Rally Revo in the States) was an altogether different beast in a lot of ways. 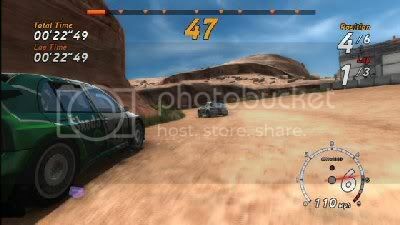 It retained the awesome handling, but added loads of tracks in the form of Championships and Leagues. It was, and still is, eye-wateringly, hair-tearingly difficult. I mean, it's rock hard. Every now and then, I'll find myself loading it up in the forlorn hope of eking out a few points so that I can unlock the next League. It's so, so hard. And yet, I still love it. Wonder if that place is open? I fancy a bacon sandwich. Now we have Sega Rally Online Arcade, a Live Arcade title by Sumo Digital, weighing in at just 800 points. What a bargain! Or is it? I've had a good go at finding out. Sega Rally Online Arcade follows OutRun Online Arcade in updating a classic Sega arcade game for the XBox Live Arcade market. OutRun Online Arcade was amazing, featuring the classic five-ending race and a Heart Attack Mode. It was also a great high score game, and I was involved in some epic tussles on my Friends Leaderboard, with positions changing all the time. In the end, my son Aidan, who was eight years old at the time, emerged at the top. Little swine. You're not going to get as much leaderboard fun out of SROA, because you don't score points. You're also not going to get as much depth... whereas OutRun has fifteen different stages to master, SROA has only five (as far as I know at this point - oh, and they're all similar to those in Sega Rally Revo). 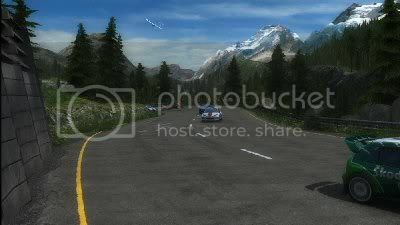 You can tackle three of them from the outset in the Quick Race Mode, and if you try the Championship and race through all three in first place, you will unlock Lakeside... finishing first in that one will see you unlock it for Quick Race play. The fifth course is the classic Desert course from the original Sega Rally, and you get to race on that using the classic cars from that game. It's a lovely touch... it would be lovelier if you got all the original tracks (I don't know at this point that you don't, they may be unlockable, but it doesn't look like it). I have to say that the car handling feels different in this game to past games. I find that a bit odd in some ways... surely it should feel the same as the first 360 Sega Rally? But it's a bit more arcadey, a bit more forgiving. Whereas I love that first 360 game, it really is rock hard and that's offputting to some. This one can be blasted through fairly easily. It's an exercise in fun. You wouldn't enjoy battling your buddies if you were gnashing your teeth at the difficulty level, would you? So, it doesn't sound like you get that much, but it's only 800 points, which is a bit less than seven quid. And I think the focus is set more firmly on the Online aspect... this IS an arcade game, and the intention is to fire it up for a quick blast with your mates, with the single player mode being ideal for practicing or if you fancy a bit of high-speed action without any major time commitment. I reckon it does the job very well for the price... see you on the beach! by PaulEMoz in "Marvel", "Pinball FX 2", "Top 10 of 2010", "XBLA", "XBox 360", "Zen Studios"
I'm rubbish at pinball. I don't even understand it, to be honest. You have all these objectives that you're supposed to complete, and I never know what I'm supposed to do. So I just bat the ball around the table for as long as possible. And that's OK. I enjoy that. It's all good. But you'll already know all that if you read my take on it back in October. Never saw Spidey resort to using shiny metal balls in his fight against crime. 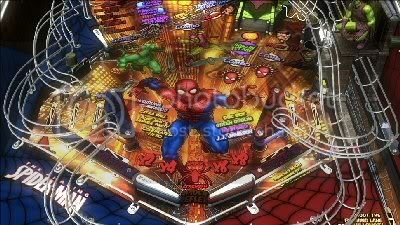 Since I first played Pinball FX2, Zen Studios have released a series of Marvel-themed tables, which I have also bought. They're all pretty good, and having familiar sights and sounds on a table adds a bit extra to the appeal. 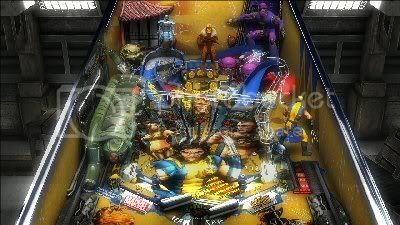 So altogether, with the imported tables from Pinball FX, I've got seventeen tables on my Xbox 360. That's one of the best things about playing old-school games on a modern system... where the hell would I store them all if they were real tables? Careful, Wolfie. You'll have the table on tilt with your temper. 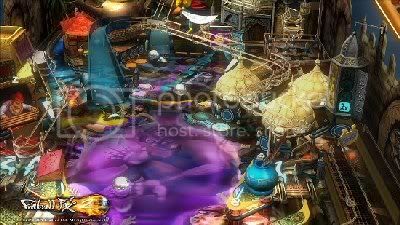 Pinball FX2 is probably one of the ultimate “casual” games for me... I really only tend to play it when I'm not in the mood for anything specific or can't be bothered trawling through my shelves of partially-played games. It's a great way to kill fifteen minutes or so, too... and I've killed an awful lot of fifteen minutes', I have to say. And that's about it, really. Besides the great online Friends' leaderboards, there's nothing terribly revolutionary here, just an awful lot of good pinball. But what more would you want from a pinball game? Pinball FX2 does exactly what it's supposed to, and that was enough to land it at Number 10 in my rundown. by PaulEMoz in "Pinball FX 2", "XBLA", "XBox 360"
I'm not going to pretend I'm any kind of pinball expert. In fact, I'm rubbish at it. "Hit flashing ramps for bonus!" "Hit targets for multiball!" Whaaaat? I just like whacking the ball and hoping it doesn't get past my flippers. Am I a bad man? It goes without saying that I'm not exactly cultured in this regard. Doesn't matter. I love racking up high scores, and pinball is one of the purest forms of this exercise, so from that point of view, it makes me happy. And I can quite easily sit and zone out on a pinball game for hours. It can be quite therapeutic, as well as fun. This table is called Pasha. It's filled with Turkish delights! I downloaded the original Pinball FX... oooh, a good while ago now. Over time, I've downloaded all but one of the additional tables available for it, and when I feel like playing something that's not too taxing, it's kind of my fall-back game. I can just chuck it on and sit there, merrily flipping away for fifteen minutes or an hour, or whatever. So I was very interested to find that a sequel was available, and for free, no less! Well, actually, that's not entirely true. What you get for free is basically a new pinball engine. The clever bit about it is that you can re-download any tables you've already bought for the original and play them in updated form. That said, they don't seem that updated - there's a flashy trail effect to the ball, but that seems to be more or less it - but most of the tables get three new achievements each, for a total of 39 new cheevos. That's a heck of a lot for an XBLA title! The majesty of Rome... in pinball form! If you do stump up the 800 points, then you get four brand new tables, and these ones do seem to have ramped everything up a bit. There are four distinct themes, so you're never in too much danger of getting confused as to where you are. That said, the gameplay on all the tables is pretty similar... flippers, ramps and bumpers are all in much the same places, and objectives are all pretty much the same. I know the objective is to make these like real-life tables, but I think in some cases they could use the technology to come up with something really outlandish. Still, I'm being a bit petty. I've happily downloaded Pinball FX, Pinball FX 2 and all the extra tables bar one, which for 200 points I might as well get as well. I couldn't tell you how these stack up against the classic real pinball tables, but they're enjoyable enough that I can play them at any time and while away a good chunk of my evening. 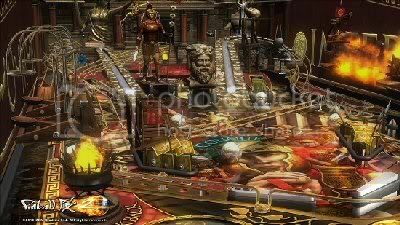 Pinball FX was kind of a guilty pleasure for me to begin with... Pinball FX 2 ramps that up by a few notches, so that should be me happy for the next three years or until Pinball FX 3 comes out. 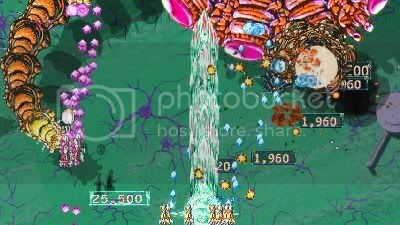 by PaulEMoz in "360", "Mommy's Best Games", "Shoot1Up", "XBLA", "XBox", "indie games", "shmup"
Every once in a while , you come across something that is a very pleasant surprise. One of the nicest surprises of A Game A Day so far has been Shoot1Up, which cost me all of 80 Microsoft Points (60-odd pence) when I first bought and played it at the end of February 2010. Shoot1Up is probably the simplest game in my top 10, so there's maybe not much I can say about it that I didn't say three months ago. It's a terrific piece of arcade fun, and although it's not tremendously difficult, the real fun lies in getting a high score. And that, my friends, is the essence of arcade gaming, and something I still love to play for after 30 years. That's the stuff. Massive laser death all round. I've played it a bit more lately, and I seem to have missed a couple of things in my initial euphoria. The first thing I missed was the Score Trek mode. This, as you might suspect, is a score attack mode, but you only get one ship to make it through as much of the game as usual. It's quite a clever way to incorporate a score attack mode into the game. 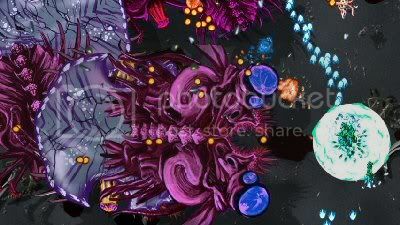 That fat purple thing is an end-level boss. It's huuuuuuuge! Something else I missed, or at least I think I missed, concerns the scoring system. When you shoot anything, the score you receive appears in a box in big numbers on the screen. Naturally, I presumed these scores were just added to your total. But it appears, I think, that you have to collect them to add them to your score. That's pretty novel for a shooter, and adds another element of risk/reward to the game. Shoot1Up seems to be doing very nicely on XBLA's Indie Games store. It's certainly planted itself in the Top Rated games section, and rightly so. It's a game that I expect to be playing for a long time yet, even if it's just to pick up and play for fifteen minutes. It's easily one of my ten most enjoyed games from the blog. by PaulEMoz in "80s", "Game Room", "Krome Studios", "Microsoft", "XBLA", "arcades", "retro"
Microsoft threw Game Room at us from out of nowhere a while back, and since then, I've been waiting excitedly for its arrival. Now it's here I've snapped it up, and thought I might as well give my initial impressions. In case you don't know what Game Room is, I'll tell you. It's as close to owning your own arcade as you'll ever get, unless you win the EuroMillions. Look at the size of that place! You could fit stacks of games in there. The setup, I think, is quite nifty. 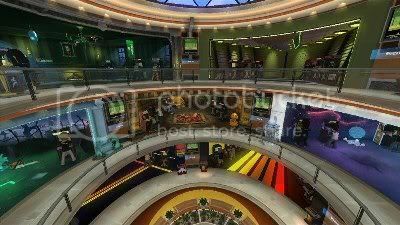 You're given a huge building interior, with loads of rooms, and you can fill these rooms with arcade machines. Some are actually classic arcade games, and some are custom-designed machines that play old console classics... currently for the Atari 2600/VCS and Intellivision. I'm not sure if other systems are in the pipeline, but you'd have to imagine they will be. You're given a few themes to choose from at the beginning, so you can set up each room in a different style, and then plonk your games in whichever room you feel appropriate. There's also different items of decor that can be strewn about for added ambience. More themes and decor can be unlocked as you play in your Game Room. I love the 80s! To cater for the likes of me, many themes are available for your rooms. 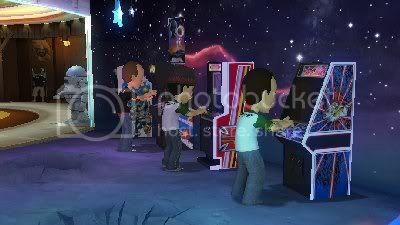 An added extra which adds something unique and fun to the gameroom is the mascot feature. Each game has a mascot, based on a classic iconic character from within the game. These can be bought separately at the shop, or you'll get them for free if you buy the game on its release date. It's fun to see these little daft characters pottering around in your arcade... I love seeing the Adventure duck/dragon roaming around, and characters are in danger of a kick to the head from my Shao-Lin's Road mascot (not really!). There are down sides... the range of launch titles is not the best, meaning that you're unlikely to find any well-stocked arcades on your travels just yet. Still, as time goes by this will improve, and I'm genuinely excited to see how my arcade builds up over time. Ahhh... happy memories. And barring gaming megaplexes, the only time you'll see your mates standing at arcade machines. Also, there are server problems. So far, I've found it pretty difficult to upload any challenge scores... it's a shame that this isn't running smoothly, because the potential that exists from challenging your mates is massive. I'd hate for them to be put off because they can't connect to upload their score. Still, I see masses of potential in Game Room. A lot of people are unhappy with it... unjustly in many ways, I think. 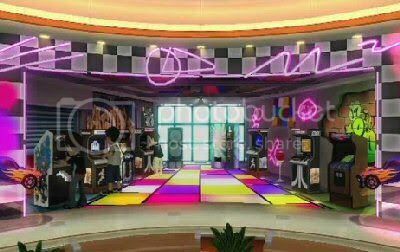 It has to bed in before it can be properly judged, but I think that if you used to hang around in arcades when you were in your teens and/or love 80s arcade games, then Game Room is going to eat up a lot of your 360 time in the coming months... I'll revisit this one a little way down the line, to see how it's holding up. by PaulEMoz in "FPS", "N64", "Perfect Dark", "Rare", "XBLA", "XBox 360"
Perfect Dark is one of the most revered games of all time. But as it was on the N64, I didn't get to play it. Never thought I would, either... until an updated version was released on XBox Live Arcade, for 800 points. Handy! However, coming into it without the benefit of rose-tinted glasses makes the game a harder sell to me. 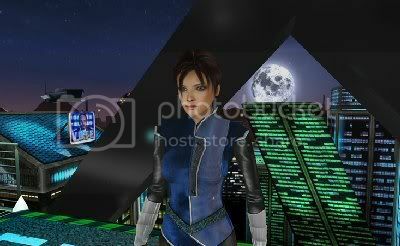 I'm not that much of a FPS player to begin with, but those I've played lately are modern, state-of-the-art efforts, and however groundbreaking the original Perfect Dark might have been, this update would have to go some to match any of them. I'm not sure that it goes far enough. For a start, although it's only on XBLA, it's still just an update of a two-genereations-old game, and so it doesn't look all that great. It's serviceable, sure, with some nice touches... but it still looks like a bit of an old wrinkly. Gameplay isn't what I would call sublime, either. There's nothing wrong with it... in fact, old-schoolers might prefer the lack of hand-holding. But in areas that look very similar everywhere you go, it's quite easy to get lost, or rather, not know where you're meant to be going next. You're Out Of Your Mind, thinking that looks like Mrs Beckham. Mind you, although I said there was a lack of hand-holding, I played on the first (easiest) difficulty level, and the aiming was more or less done for me, and the guards were a bit on the stupid side, allowing Posh Spice, sorry, Joanna Dark to wander around relatively stress-free. There's no doubt I haven't got the most out of this game at this point... I need to play on a tougher difficulty level, and I haven't even touched the multiplayer, which is the aspect most fans of the original seem to love best. I like the "spy behind enemy lines" element of the game, and I suspect I'll press on and look for improvements... but for me, it's not the all-conquering supergame it's been labelled. 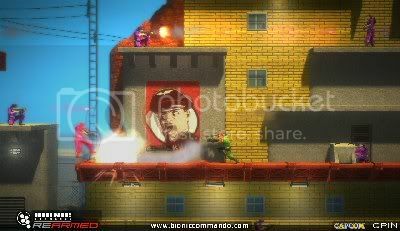 by PaulEMoz in "Bionic Commando", "Capcom", "Commodore 64", "NES", "Rearmed", "XBLA", "XBox 360", "arcade"
Bionic Commando is a name that goes back a long way. I used to love the Commodore 64 conversion of the arcade game. It was tough but fun, with great music. I never got to play the arcade version, but that hardly matters. If you're American, though, the Bionic Commando name means something entirely different. A brand new version was produced for the NES, which although having a similar main character was a very different game. It's this version which has been remade for the modern consoles. I bought it the day it came out, played the tutorial, hated it and never loaded it again. Still, the name holds an appeal, and when Capcom produced a brand new, all-singing all-dancing update, I was interested. I wasn't forty quid's worth of interested though... but months and months later, I was able to nab it for £4.50 from Tesco. Rude not to, at that. Before playing that, though, I thought it might be wise to revisit BC: Rearmed. Ka-BOOOOM! Even the poster is shocked at the power of that one. Having spent a bit more time with Rearmed and getting to grips with the controls a little more, I started to enjoy myself. The game reminded me quite a bit of Shadow Complex, although that game came out later. It also reminded me of Impossible Mission, strangely enough. I think it was the behaviour of the guards that did it... they'd wander around their little areas quite happily, but when I got near they'd maybe move faster or start firing. It's quite a bit like Impossible Mission's robot droids. Once I got myself over the fact that your commando can't jump (which I still think is silly, but no longer insurmountable), I started pinging myself around the platform-strewn environments quite handily. And it becomes fun, swinging across a gap, landing successfully , taking out a guard, catching onto the platform directly above, hauling yourself up, hanging there, blasting another guard and then vaulting up onto the platform. Turning that into a fluid, seamless action is very satisfying. It feels right, it feels good. That's the bugger, there. Let me pass! There's a small amount of other spy elements here... hacking the computers is also IM-esque. It's a bit weird to start with, but it soon becomes manageable. Just as I was really getting into it, though, I came to the first end-level boss. And that's where I remain. I just couldn't figure it out at all, even with the clues I was armed with. In fact, we came to an impasse... it couldn't hurt me, and I couldn't hurt it. After 15 minutes, it was back to the dashboard. Shame, really... there's a lot of game for the MS points, and although it's tough, it feels more challenging than unfair. It's presented very nicely... modern, but with plenty of nods to the old-school. I expect I'll have another crack at this one, probably after I've had a look at GameFAQs or something. I hope the brand new version can live up to this one. 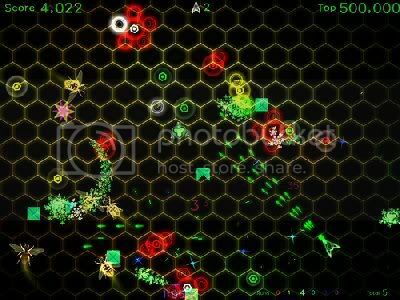 by PaulEMoz in "Atomhex", "Geometry Wars", "XBLA", "ZX Spectrum", "arena shooter", "indie games", "retro"
Another day, another 360 indie shooter. 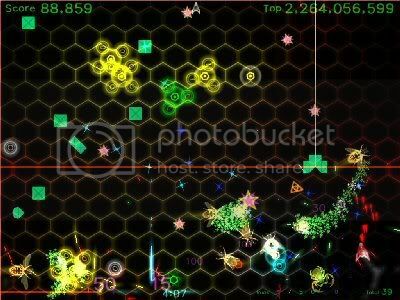 Atomhex is an indie game, and it's a twin-stick arena shooter. There's a lot of them about, so if you make one, it has to have enough worthwhile features of its own to make it stand out. I would say that Atomhex just about does. A triple stream of laser death. Handy, with those big atomhexes around. 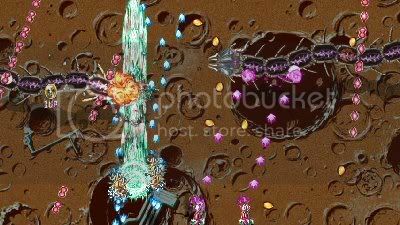 You control an Asteroids-style ship, and you whizz around the arena, using your other stick to shoot in whichever direction you choose. I'm not sure I like that in this game... because of the shape of the ship, that mode of firing looks wrong. It's the right choice of control method for the game, though... maybe a different design of player ship would have been a better fit. That's not my high score. That's just insane. 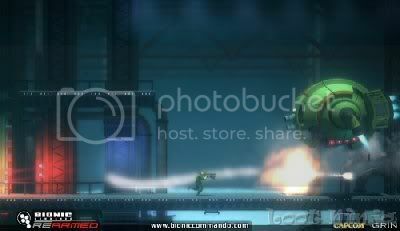 Although this is more dangerous, it's very good for your score, and massive bonuses can be had at this point. Also, it's just more fun when you're barely in control. That said, Atomhex never really clicked with me like I'd expected it to. Still, it's cheap, there's lots to shoot, and there are 100 Awards to unlock, which is nice for an Achievement-deprived indie game. It's certainly worth a punt if arena shooters are your thing. How much is that, anyway? If you buy points from XBox.com, that's 68 pence. Let's make it 70. Now let's convert it into the currency of the arcades... seven tens. If Shoot1Up had been in the arcades when they were in their heyday, and if you could have got past the iffy name, you would have easily spent seven tens on it, and probably a fair bit more. 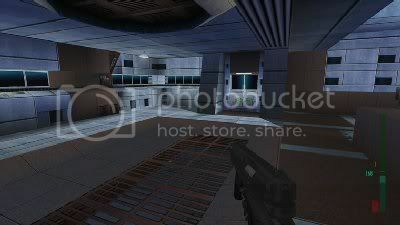 Shoot1Up is like a cross between TacScan, Terra Cresta and... oh, I don't know. Something else beginning with 'T'. Truxton. That'll do. Something with a lot of bullets. You start the game with a fleet, nay, a phalanx of fighter planes. As you'd expect, alien hordes are in need of dispatching, and your boys are the ones given the task. Here's the game mechanic. You start with a small fleet of ships. Holding the A button fires a stream of bullets. The trigger buttons will expand or contract your fleet of ships. If you contract, the ships fly "on top" of each other, so they only take up as much room as one ship. As a result, you only unleash a small stream of bullets. 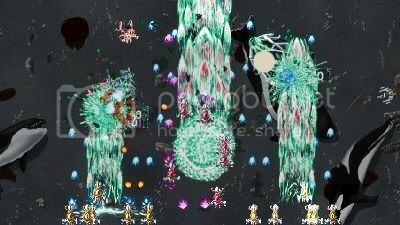 It also makes it easier to dodge enemy bullets and ships... but as a consequence, your scoring is reduced. 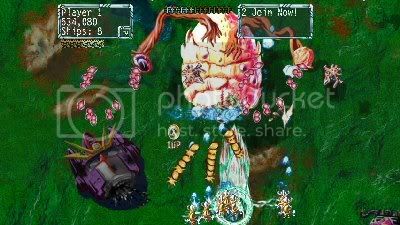 If, however, you expand the formation, then your ships' firepower links up to produce an awesome blast of laser death, far more destructive than when they're contracted. And as this is a riskier tactic and you're more prone to losing ships, you score more heavily. You can't just stay expanded, though... at times it will be necessary to narrow your field just to stay alive. If you lose all your ships, it's game over. Luckily, though, you can obtain additional ships quite regularly, and they're instantly added to your fleet on the screen. Nothing is kept in reserve... it's all out, all of the time. The most ships I've had at a time is 18, but I think the maximum available is 30. Occasionally you can also pick up a Ghost, which puts a mirror of your fleet on screen for a limited time, for twice as much damage potential. With only six levels, it's not hard to get to the end, although those six levels are bolstered by a choice of routes as you go. And although the graphics look charmingly old-school, the backgrounds repeat a bit too much, which is a wee bit of a shame but nowhere near a problem. I also hear talk of a problem where using the shield attack gives you an unbalanced multiplier, resulting in massively over-inflated scores. I wouldn't know, I've never used shield attack! Even with those "issues", there's no way you can say this isn't worth the money, if you're an old-school arcade shmup fan. In fact, I'd happily pay more. I've played it a few times now, giving myself the good old claw hand from playing it a bit too intensely. And I certainly intend to go back to improve my score. Shoot1Up may not be as subtle as the likes of Leave Home, but it's a hell of a good time for your seven tens.